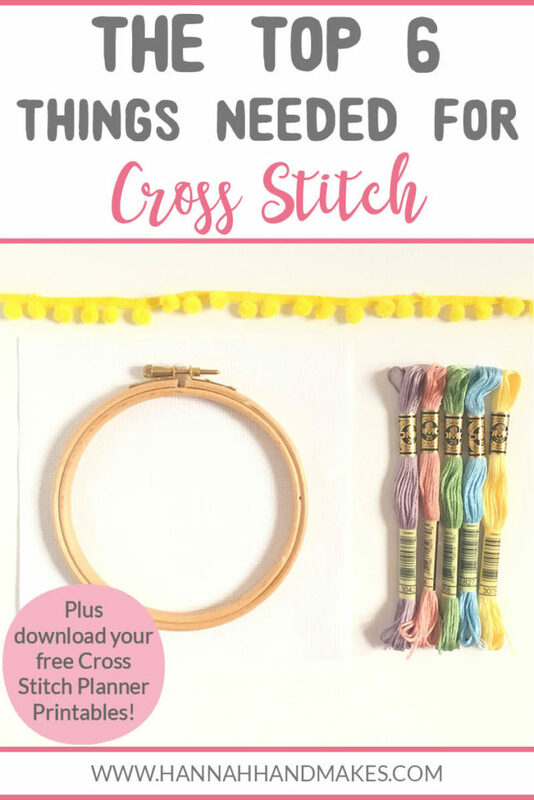 In this post, I’m sharing the top 6 things needed for cross stitch (as well as few helpful extras). The great thing about cross stitch is that you don’t need much to get started; no big machines or complicated tools! 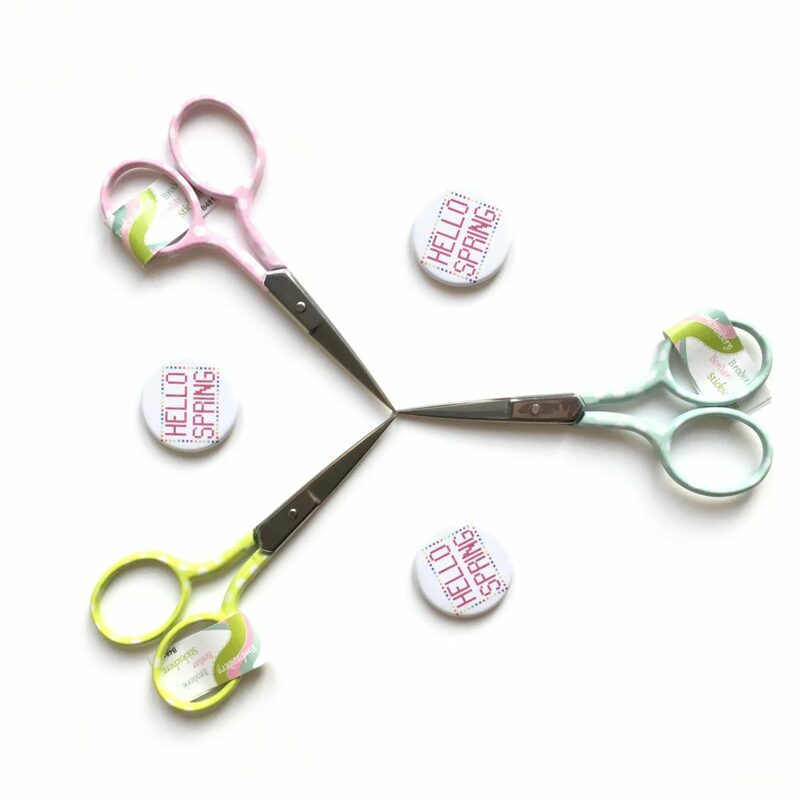 If you are new to cross stitch you might also be interested in my brand new How to Cross Stitch Course for Beginners that is launching 29.04.2019. You can read more about the course and the early bird special pricing here. And don’t forget to sign up for your cross stitch freebies including some project planning sheets and a How to Cross Stitch E-book! The fabric used for cross stitch is usually aida or Evenweave/linen (these two come in the same counts but are made of different materials; Evenweave is cotton and modal and obviously linen is linen). These fabrics are perfect for cross stitch because they are weaved evenly, so that there are small squares with holes on each corner for you to make your “X” stitch over. They each come in different “counts” and the higher the count the smaller your stitches will be and so the smaller your overall design will be. The count is the amount of holes per inch (HPI) of the fabric. The most common counts for aida are 14, 16 or 18 but they also come in 6, 8 and 11 and Evenweave/linen ranges from 22 to 36 count (the most popular is 28 and 32). The difference between aida and Evenweave/linen is the feel of the fabric. 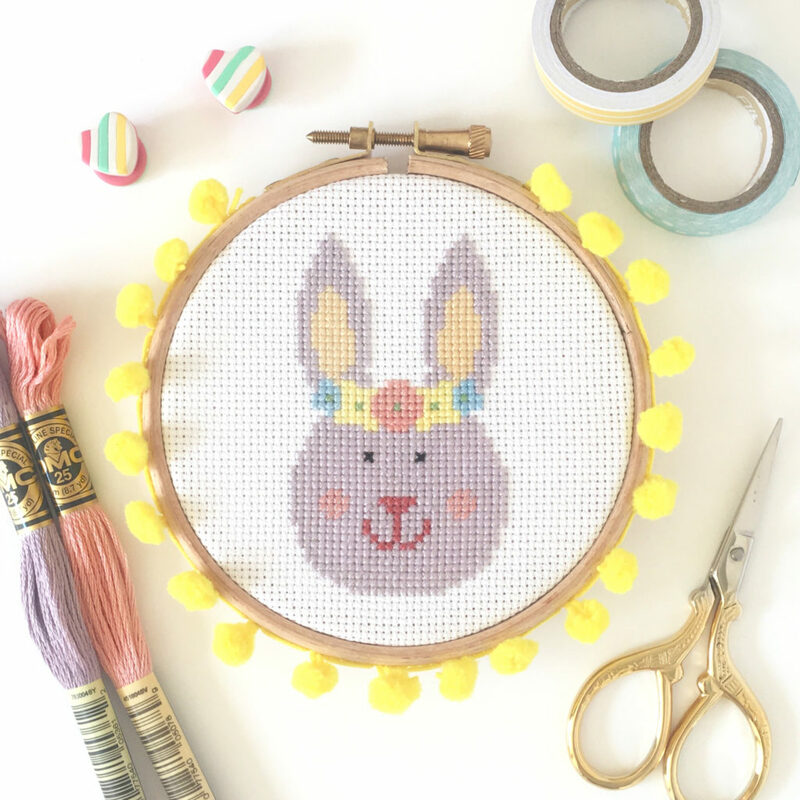 Evenweave and linen are much softer and flexible, but aida is perfect if you are a beginner to cross stitch. The other difference is that on aida you stitch from one hole to the next but on Evenweave and linen you “stitch over two” which means when you are making your stitch you miss a hole each time. To make your design the same size on both aida and Evenweave/linen, you just double the count of the aida. For example, if your design calls for 14 count aida then you can stitch it on 28 count linen and the size will stay the same. The two brands of fabric I recommend are DMC and Zweigart. 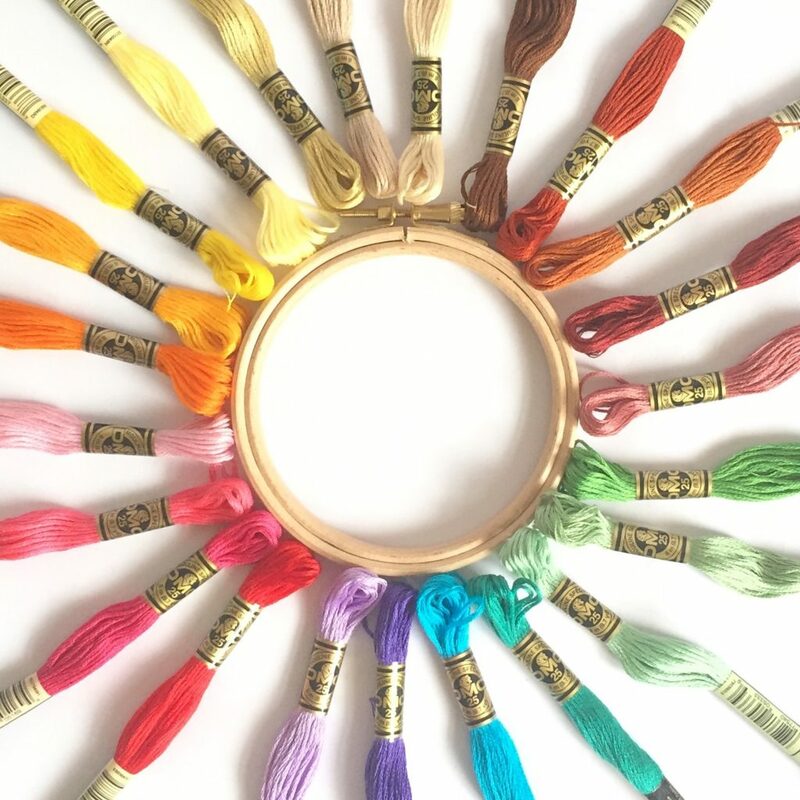 I personally use Zweigart; they have a huge range of colours and types and a little fun fact; you can tell if your fabric is Zweigart because they stitch orange thread through the selvedge. You can also get waste canvas which is used to stitch onto towels, clothes etc. You attach the waste canvas to the garment, stitch over it and then take the canvas off. For some you use water and it dissolves and others you have to pull the threads out. And I use Zweigart aida in all of my cross stitch kits which you can find in my shop! The needles used for cross stitch tend to be called cross stitch or tapestry needles, and they come in different sizes that relate to the thickness of the needle. The most commonly used size is 24 and this is perfect for 14 count aida and 28 count Evenweave/linen. The bigger the count of your fabric, the bigger the size you want your needle (although this actually means the needle will be thinner). For example, 16 count aida or 32 count Evenweave/linen needs a size 26 needle and 18 count aida or 36 count Evenweave/linen will need a size 28 needle. There are so many brands of needles but I personally use Milward in my cross stitch kits. Embroidery hoops or frames are used to keep your fabric taut while you are stitching on it. This make it so much easier and quicker to stitch your design. They come in a huge range of sizes and shapes and materials. You can get wooden or rubber (flexi), and q-snaps are plastic tubes rather than a hoop. They can be round, oval or rectangle and as small as 2 inch to a huge 12 inch. You can even get frames that are on a stand so you don’t even have to hold it while you are stitching – yay! 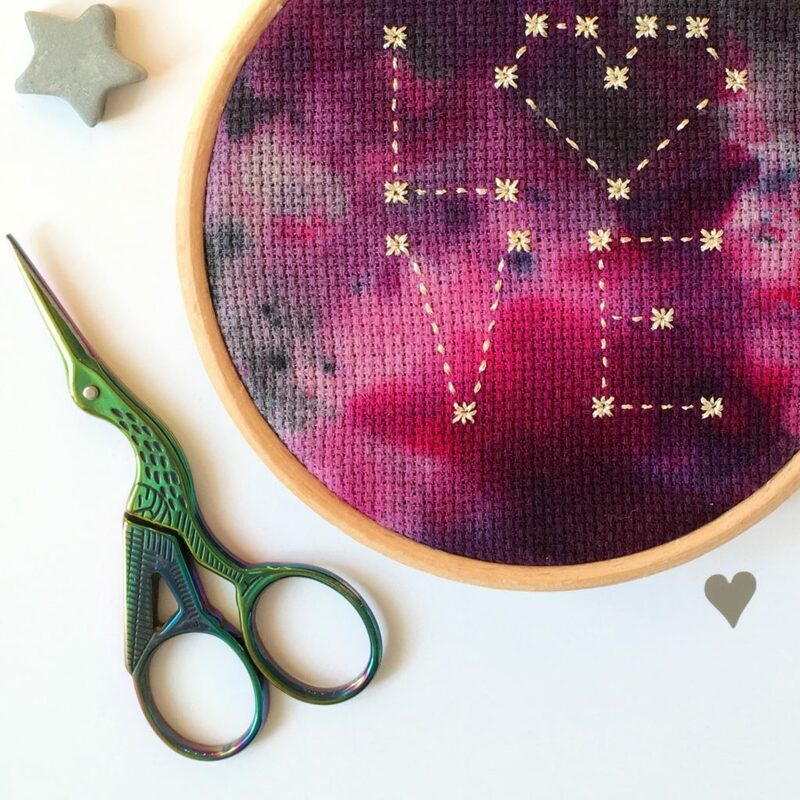 Although the main purpose of the hoop is to help you stitch, they also make great frames for your finished work. This works better for smaller pieces and gives your finished piece a bit of extra personality. The brand of hoops that I use is Elbesee. These are the best I have come across so far; they are thick, smooth and have a proper screw on top so you can actually use a screwdriver to tighten the hoop if you need to (I have no upper body strength at all so I use screwdrivers a lot on finished hoops). 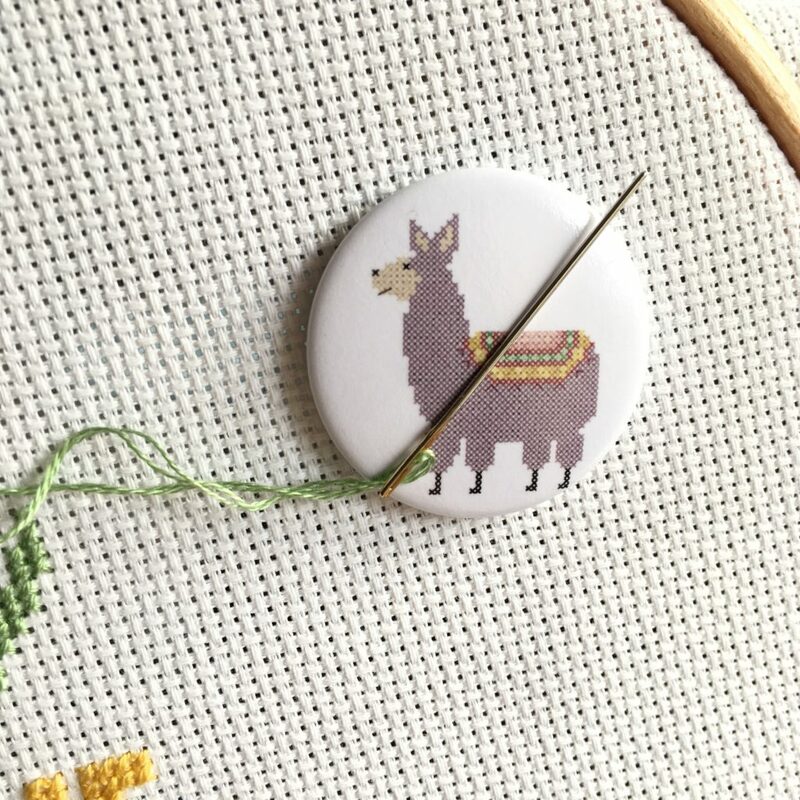 Ahh, my favourite part of cross stitch! I love the colours and types of floss you can get. The main thread used for cross stitch is stranded cotton. Stranded cotton is made up of 6 strands of loosely twisted thread and for cross stitch you only need to use 2 of these strands so you get a lot of stitches out of 1 skein of thread/floss. There is also Pearl cotton which is just 1 strand of thread but it’s about as thick as 3 strands of cotton. This is mainly used for hand embroidery but you can use it for cross stitch too. I’m going to talk about a specific brand of floss now (DMC) but I know that other brands also do some of these types of floss. I just use DMC myself and know a lot more about their products than I do about Anchor for example (which is another popular brand of floss). You can get DMC floss in most needlecraft shops, both online and in brick and mortar. They have lots of types of thread; stranded cotton, Pearl, Light Effects (you can read more about Light Effects floss here) and Variations (this is floss that has a few colours in 1 strand of thread so as you are stitching the colours change without you needing to change your thread). They have over 500 colours in their collection and have recently released 35 new stranded cotton colours which you can currently buy from Sew and So here. And now they also have 35 glitter threads called Étoile thread which you can read more about here and again you can buy these from Sew and So. Patterns are usually made up of symbols and some are in colour and some are in black and white. There are benefits to both; I think colour ones are easier to follow but black and white are easier to mark off as you are stitching (a little tip; if you use a pencil to mark off your stitches, you can rub it off when you are finished and start again)! There will also be a key near your pattern telling you which colour each symbol is; making it super easy to buy the colours you need before you start. There are so, so, so many cross stitch patterns in the world and they have never been easier to get hold of one. Etsy is my favourite places to find cross stitch patterns; you can search, buy and download with just a few clicks. I sell my own cross stitch patterns on Etsy. And a little tip, depending on the size of the pattern, you might not even need to print it off. I very often just save the PDF to my phone as a photo and work from it on my screen. This doesn’t really work for larger patterns that you need to mark off as you stitch but it’s great for those small, quick projects. Another place to find patterns is magazines! There are a few cross stitch magazines out now; Cross Stitch Crazy, Cross Stitcher and The World of Cross Stitching are 3 that I see in most shops that I go in. I put myself on a magazine buying ban because it was getting a bit silly how many I had, but I recently subscribed to Cross Stitch Crazy digital editions. It only cost me £24 for the year and I always get the new editions without even going to the shop! The only downside is that you don’t get the free gift but if you are anything like me, I already have enough supplies to use for the patterns in there. And last but not least, scissors. You might think these are the most boring part of cross stitch but not any more! You can get so many cute and funky embroidery scissors now; my favourite pair are my unicorn ones from Cloud Craft. Or I have a small supply of mermaid scissors, polka dot scissors and rose gold scissors. Scissors are mainly used to snip your thread; either to cut the skein to the lengths you need or to snip the trails at the back, which I recommend doing as you go along to save getting it all tangled at the back (yes, I’m speaking from experience). Embroidery scissors are the best thing to use as they as the easiest but you can just use any pair of scissors you have around the house. 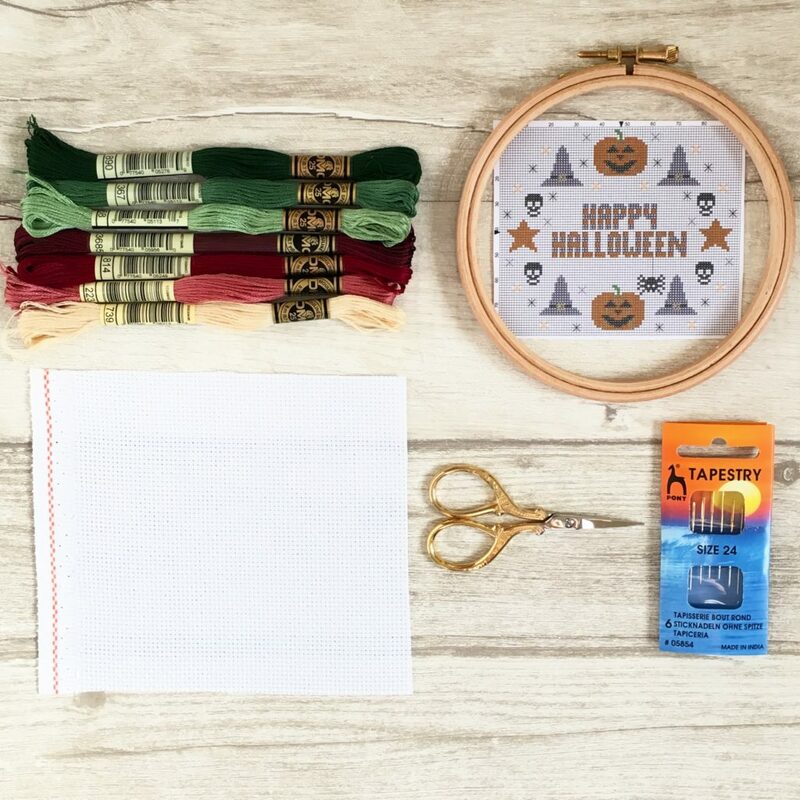 So those are the 6 things you absolutely need for cross stitch but these extras will help make your stitching even easier and so, more fun! A pencil – use this to mark off the squares on your pattern that you have stitched. I don’t always need to do this, it depends on the size of the pattern. And you can use a pen but I always recommend a pencil for the reason I mentioned above; you can rub it out at the end and re-use the pattern. A little pot or bag – These are handy to have to put the trails of threads you snip off in. A bigger bag – Used to transport your kit and especially good if you stitch while commuting and great for keeping all your supplies in one place. I sell colourful, cotton ones or I can highly recommend these craft pouches from Sarah Ashford Studio. A notebook to plan your projects or you can download my pattern planning sheets if you sign up to my newsletter or you can buy them straight from Etsy. Tea/coffee/cake – These almost went in the top 6 needed. There’s nothing better than getting cosy with a warm drink, a piece of cake and some cross stitch.